From the expulsion of man from the Garden of Eden to the final judgment of an ascendant Christ, Albrecht Dürer’s breathtaking Small Passion, widely considered the old master’s magnum opus, has moved viewers for over half a millennium. Born in 1471 in the wealthy, commercial city of Nuremberg, Dürer apprenticed as a painter and printmaker before setting out on his own in the late 1490s. Travelling across Europe, he quickly garnered a reputation for his immense talents and natural charisma, becoming increasingly popular in Italy where he had lived and worked in the bustling town of Venice. By the 1500s, Dürer had turned his hand from oils to printmaking. Plagued by the pressures his newfound celebrity had placed on painting canvases, the grainy texture of printed ink and the economy of the press drew the artist to wood engraving. Cheap to produce and easily distributed, the woodcut lent itself to popular imagery that could be disseminated throughout the masses. Dürer’s first major project, and today his most celebrated, was the Small Passion, a suite of images depicting the final days of Christ’s life. 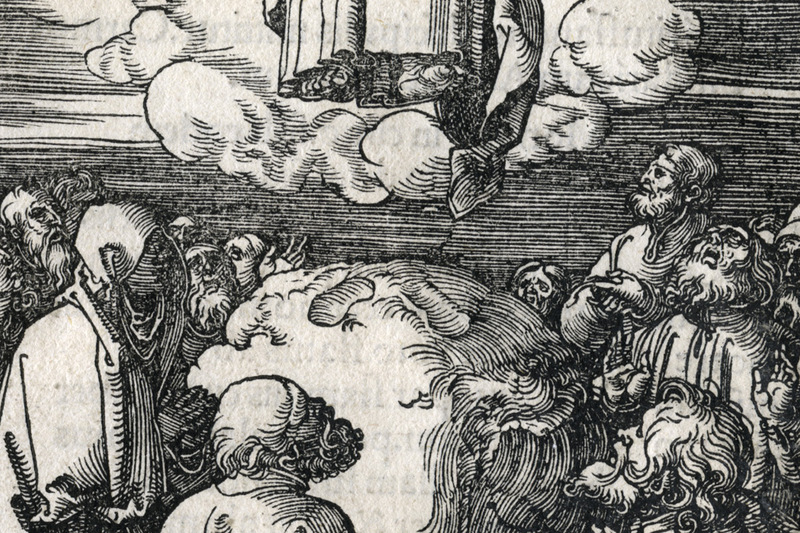 The story that culminated in Jesus’ ascension was familiar territory for the artist, for whom there existed an already established iconography of the tale of the betrayal, crucifixion, and resurrection. Dürer’s 36 images, however, with their simple, direct compositions underscored by complex gradations of tone and shadow, offered a poignant innovation of this well-worn theme: beginning with the traditional fall of Adam and Eve, Dürer’s designs intersperse Biblical passages from Christ’s early years, anticipating the coming sacrificial saviour and lending the series a deeper emotional narrative. Particular scenes stand out for their pathos and arrangement: the close embrace of The Fall of Man, delicately subverted as Eve, eyes turned toward her companion, offers the outstretched apple to Satan’s coiled serpent; the pain of The Agony in the Garden, in which Dürer walks a gossamer-thin line between overwrought sentimentality and rigid stoicism; and The Betrayal of Christ, where brooding sky, clamouring guards, and the wrestling figures of Peter and the soldier frame the tortured intimacy of the Judas kiss. Completed between 1509 and ’11, the engraving of the final set of images was undertaken by master craftsmen in Dürer’s workshop, apprentices working under the constant and fastidiously strict supervision of the artist himself. Many of the engravers wrote in later life of the ‘pitiless tyranny’ suffered at the hands of their master, who insisted on perfection in every meticulous cut of the block. The young Dürer had himself trained as a wood engraver, a practice in which he became so capable that he frequently overlooked or dismissed the very real limitations of the medium: wood is a notoriously uncooperative material to work with, its natural grain biting hard against the V of the engraver’s tool. Under Dürer’s punishing watch, and with his occasional contribution to the cutting, the translation of each image from pen drawing to woodblock was immaculate. Placed side by side, the printed reproduction is as near a facsimile of the original as could be conceived. First published as a complete set in 1511, the Small Passion became a huge success, prompting widespread distribution throughout pre-Lutheran Germany and propelling Dürer’s reputation into the latter-day spotlight. A religious, artistic tour-de-force, the suite demonstrated the tremendous physical and mental energy of its author, as described by the artist and critic Nigel Lambourne: …the confidence and swaggering vigour of the cut is sustained in every illustration…when the variable and often indifferent quality of the woodblock is fully appreciated, these prints may then be properly seen as unique technical masterpieces. Exceptionally composed and exquisitely detailed, it is little wonder that Dürer’s Small Passion captured the heart of 16th century Europe, and that subsequent editions have been produced right up until the early years of the 1900s. With the deterioration of the original blocks, few later reproductions can match the first edition for quality of image and inking. Prints as early as these remain extremely scarce; this collection offers a profoundly rare opportunity to own one of the old world’s greatest printing accomplishments.